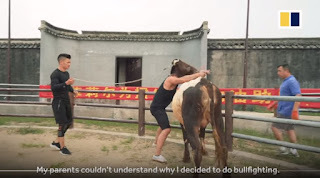 Super Punch: "The art of Chinese kung fu bullfighting"
"The art of Chinese kung fu bullfighting"
Guanniu, or Chinese bullfighting, is a traditional sport of the Hui ethnic minority, that dates back thousands of years to the Yuan and Song dynasties. During the fight, an athlete aims to wrestle a bull to the ground within three minutes. Han Haihua was the first to formalise Chinese bullfighting by bringing kung fu and bullfighting together. In 1982, Han became the first athlete to wrestle down a bull at China’s national games. He impressed the country and became known as China’s first bullfighter. Here are Master Han’s three rules for kung fu bullfighting mastery.